ABCYa is an award-winning leader in free educational games and mobile apps for kids. The innovation of a grade school teacher, it offers elementary students hundreds of fun, engaging learning activities. Discover the inventors, politicians, performers, activists and other everyday people who made this country what it is today. Their mission is to help kids love numbers so they can handle the math in real life. Fun, easy ways to integrate math into your daily family routine. A fun and educational website designed for students, parents, and teachers. ​based on information resources available on the Government Printing Office website. BrainPop is a group of educational websites with over 1,000 short animated movies for students in grades K-12 (ages 6-17), together with quizzes and related materials, covering the subjects of science, social studies, English, mathematics, engineering and technology, health, and arts & music. ​ about what scientists do on the job. NASA's ClimateKids brings the exciting science of climate change and sustainability to life. Targeting upper elementary aged children the site is full of interactive games, hands-on activities, and engaging articles that make climate science accessible and fun. Pennsylvania's public libraries are passionately committed to strengthening children's early learning. This site provides resources, activities, and early literacy programming ideas for parents to share with their children. Articles, games, videos and more to explore with this interactive science-based site that encourages exploration and discovery. Learn about energy and try some fun games and activities. Discover what energy is, where it comes from, how to save energy, and more. Get homework help and find facts about thousands of subjects including sports, entertainment, history, geography, biography, education, and health. NASA for kids: clever games and activities teach kids about math and space. ​along with fun competitions, games, and more. ​and other PBS kids shows. kid-friendly data bases. Power Library resources are made possible in part by Library Services and Technology Act (LSTA) funds from the U.S. Institute of Museum and Library Services and through Library Access Funds administered by the Office of Commonwealth Libraries, Department of Education,Commonwealth of Pennsylvania, Tom Wolf, Governor. The latest science news from around the globe. ​ (Science, Technology, Engineering, and Math). Daily news site for kids, tweens, and teens. From animals to entertainment you'll find the most compelling, relevant, and interesting news all on one site. Where natural curiosity and imagination lead to exploration and discovery. Great Websites for Kids is a compilation of exemplary websites geared for children from birth to age fourteen and contains hundreds of links. ​Sites are evaluated by the Association for Library Service to Children, a division of the American Library Association. ​Sign-up for Free Books for children ages birth - five who are residents of Warren County. 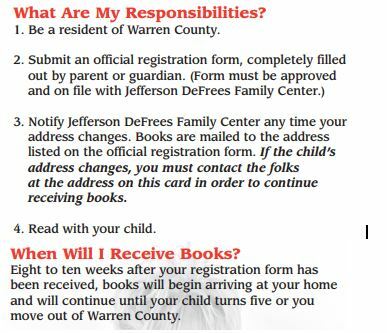 Jefferson DeFrees Family Center is a liaison/contact for Dolly Parton's Imagination Library program. The Imagination Library will provide a new, high quality, age-appropriate book each month to children in Warren County from birth to age five - AT NO COST TO THE FAMILY. Books are delivered directly to the children's homes by mail. ​Interested in sponsoring a child via Imagination Library?